To say that President Trump is a new breeze blowing out of the White House might seem as something everybody knows. The difference though, it would be an insult to liken him to a ‘breeze’; perhaps a tame tornado would be more apt. Although there are some observers who do see a real twister coming over the horizon. At least Trump is an equal opportunity basher of diplomatic sensibilities; whether at home in the US or on one of his ‘let me clean up this mess in the world‘ junkets, he has no patience with the niceties for which politicians are renowned. Perhaps this is because he is not a politician and is more interested in getting results than in the smiles and handshakes used by many to gain votes. I think one could win lots of bar bets by saying Trump has never spent time reading HTWFAIP by Dale Carnegie. Since he publicly bashes everyone with no clear signs of favouritism at all, including a good number of other political heads of governments, his verbal attacks are sure to lose effect in due course, but at the moment it seems he is overturning many of the apple carts constructed by his predecessors. In the process he succeeded to get North Korea almost agreeing to declare peace close to 70 years after the north and south started a war. Compared to what has previously being achieved this is clearly a near miracle. With the recent quite imminent threat of nuclear war receding, his main objective – to Make America Great Again – can now move centre stage. One of the two biggest problems he is facing is how the make the US less dependent on the many factories in Asia churning out products destined for Walmart’s shelves and Amazon’s Fedex and all the many struggling retailers. He has difficult hurdles to cross, not the least is that many of those factories in Asia have US owners who can see profits dropping if they have to relocate these facilities home again. The much higher costs of labour and regulation will cut deeply into their profits and off-set the promise of new jobs. The second big problem is the impoverished employee households, the majority of which were shown to have lost substantial net wealth between 2007 and 2016 in a trend that had started in the late 1990s and is still continuing. It will not be easy to reverse that trend, which is due to the manipulated CPI being used as a CoL or cost of living index to set wage and salary increases. There is no easy way to reduce consumer prices to where these become affordable or to increase household income to where a decent standard of living can be accommodated within the budget. While having to deal with ruffled feathers from foreign leaders and a very hostile domestic climate from certain quarters, the recently launched Chinese petro-yuan poses a potential threat to the US banking system should conversion of the petro-yuan into gold substantially increase demand for the metal. 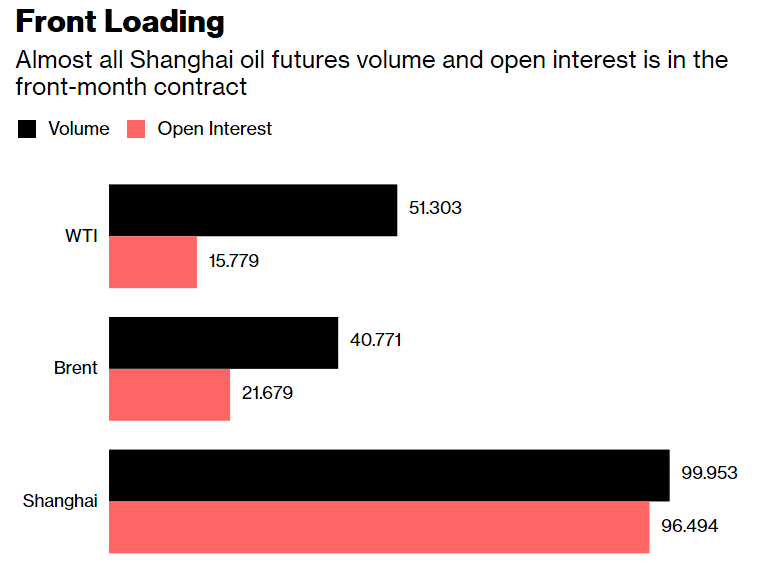 The table below shows the trading volume and open interest as in mid-July for the petro-yuan contract and a comparison with the WTI and Brent contracts. WTI and Brent contracts are spread over different delivery months; the Shanghai contract is still mostly speculative and concentrated in the front month. How many of the 96.5 million barrels open interest will stand for delivery will be revealed in September. While having started quite slowly, interest has nevertheless attracted more attention as time passed. This seems to be mostly traders as yet, but the volume according to the table is substantial. Should gold begin a rising trend, the interest of oil producers are certain to increase over time; by exchanging the yuan they received for delivery to China to gold, they can harvest a premium over the selling price in due course. This, in turn, should be of advantage for China as it is likely the price of crude through the petro-yuan can then be expected to be lower than the ruling global price. It is too early to speculate about the possible impact on the US of the petro-yuan contract since it is not known how popular it will become. However, during the first year, contracts will mature every month and the 96 million barrels for September are more than daily global oil production and more than 10 times what China has to import every day. There is thus potential for a substantial effect on, firstly, demand for the petro-dollar and as a domino effect on the volume of dollars that will return home to the US and the value of the dollar and probably on Treasuries as well. It is clear that Trump may well have to deal with a new situation that has very little precedent to provide guidance on what to do to prepare for and counter the effects that will arise as a consequence. This while by all accounts he finds himself more than hip-deep in the swamp. The next few months are going to be interesting. Gold and silver hit significant intermediate lows last week, even though there was a little improvement ion Friday. Earlier speculation here that the potential threat that the petro-yuan poses will compel the Cartel to do all they can do close their short positions. Ten days ago, the CoT report had commercials reducing long positions by over 7000 contracts, which was seen as strange. Yet as the prices of gold and silver dropped even lower last week, that change made belated sense – it was no mistake two weeks ago, knowing that the pressure on the metal prices would be sustained and even intensified. It remains to be seen whether Friday’s slight improvement will last through into this week or whether it was only a breather before a new sustained attack this week. No bets will be taken. The euro bull channel that had failed to hold has been modified to show a shallower bull channel that still contains the recent sell-off of the euro. Two features of the change, which still uses the same master gradient as before, is that the euro is holding at support from line K ($1.1607), but that the complete channel has further bearish potential before the bottom of the channel at line L ($1.1063) is tested. At line R ($1.1440) is some intermediate support as well. This analysis appears more realistic than the one used last week. This week should provide an acid test should line K prove to hold as support for the current period of consolidation that has continued for longer than a week. Most of the recent movement has been between lines F and B, holding clear of line L. The high volatility shows that the market is nervous and that there are investors who are quite desperate to reduce or liquidate their exposure to equities. At the same time, there are many parties heavily committed to supporting Wall Street to prevent the volatility from becoming a true sell-off of the market. Too early still to guess how long the stand-off will last, but a top heavy market makes the sellers the realistic favourites when the time comes. Another new chart to accommodate the sell off that has pushed to price of gold to a new 2018 low. Here too, instead of the price dangling in mid-space between support and resistance as it did on the chart used last week, gold now ended close to good support from lines C ($1214) and M ($1197). While being very hopeful for gold for the medium to longer term, and without clear guidance of how the petro-yuan will play out, one has to expect that as they have shown, the Cartel is insistent that they can shake out the longs and thereby reduce their own short side exposure to gold and also silver. The gold open interest has reversed an earlier shrinking trend to start increasing again. There are buyers who are taking a long term view and staking a claim and this is not good news for the Cartel. Just imagine being short at these low levels when gold breaks above $1300 and $1400 – irrespective whether it is the Cartel or the hedge funds. The bearish break below support along line T (€1093) and back into bear channel YZ (€1084), with a marginal break lower, is holding quite static. The changes in the value of the euro and the price of gold last week’s mostly balanced out to leave the euro price little changed. The situation with gold is a little abnormal, it seems, and it is not known how long this could last. The stronger dollar appears to have turned a little sideways, with the euro sitting in a tight range, so that most of the effect on the euro can be expected to come from changes in the price of gold. Despite the fact that the silver price is also dangling in open space, having broken below long term support and with no clear new support close by, the old analysis has been retained. There are alternatives that fit well and offer support, but line T ($15.85 has a long tradition as a significant line of support and resistance and as such offers an important level for the future movements in the price. The line does not sit at a typical psychological level such as $16.00, and therefore is valuable as a marker that can signal a recovery in the price of silver. The next level of technical support in this analysis is line U ($14.01), which is a really long way down on this chart with its magnified vertical scale because of massive price suppression since 2011 – far more so than gold. As always, the suspicion is that the reason for the sustained effort to get the silver as low as possible lies in the magnitude of the threat that the short positions pose for the Cartel. So far, despite the sustained selling, the threat has remained largely unchanged since Comex open interest is still close to its record highs. The US 10-year Treasury, following its break below along line L (2.931%), spent some time in a tight range while stuck in bull channel VW (2.824%). Last week, the yield did break from the bull channel, ending the week at the week high at 2.895%. At the moment, the outlook is for the yield to move mostly sideways, but how long that can last in a climate of rising interest rates is difficult to guess. The yield is still in bear channel PQR (2.726%), but the bond market has to rally by a good amount to test the bottom of the channel. Technically, for the bear trend to resume calls for a yield above the psychological 3.0%, that would also result in a break above lines L, Q (2.95%) and C (2.98%). Ten days week ago, the price of crude had pulled back to rest on the bottom of channel KL ($70.40), but the support there has failed to hold. yet the break lower was not followed by further weakness; the price steadied in a tight range and sits just below the bull channel. From there it can go either way – either a recovery into channel KL, as it had done not long ago when, after a break below the channel, it rebounded off support along line S ($64.40) and back into the channel. Alternatively, the price can drift sideways with no clear direction or it can become bearish again to resume the recent volatility.